We introduce a simple algorithm for non-prehensile object transportation by a pushing robot on a flat surface. We assume that the global position and orientation of the robot and objects are known. 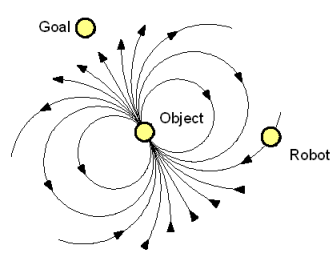 The system computes a dipole field around the object and moves the robot along the field. This simple algorithm resolves many subtle issues in implementing reliable pushing behaviors, such as collision avoidance, error recovery, and multi-robot coordination. We verify the effectiveness of the algorithm via several experiments with varying robot and object form factors. Although object delivery by pushing and motion control by a vector field are not new, the proposed algorithm offers easier implementation with fewer parameter adjustments because of its mode-less definition and scale-invariant formulation. Proceedings of the The 2010 IEEE International Conference on Robotics and Automation (ICRA2010), pp. 5114-5119.